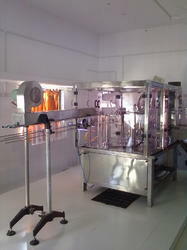 Manufacturer of a wide range of products which include pet bottle filling machine. With the expertise of our professionals in this domain, we are able to bring forth a quality approved range of PET Bottle Filling Machine. Dimensionally accurate, our offered machines are manufactured in accordance with the illustrated parameters of the industry. Besides this, to eradicate every defect, our offered machines are closely inspected on various characteristics to ensure flawlessness. Looking for PET Bottle Filling Machine ?